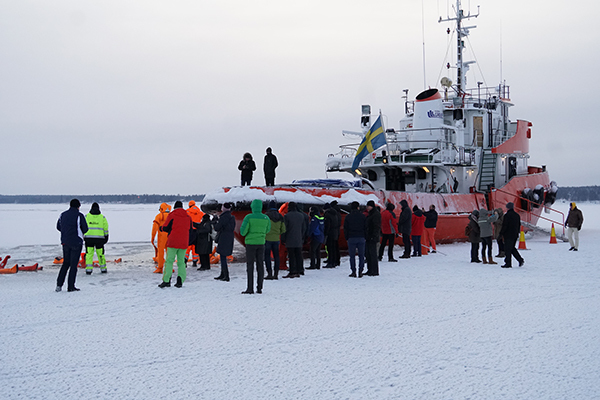 In the northernmost E-LASS & RAMSSES event to date, more than 70 participants traveled to Swedish Lapland in January to discuss maritime lightweight solutions. Primarily in focus was rules and regulations as well as material solutions such as composites, aluminum and high strength steel. 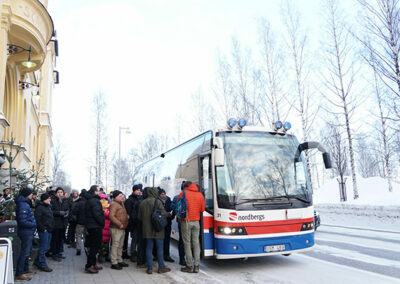 Right after lunch at Piteå Stadhotell, a bus transported all participants to the Composite village ‘Öjebyn’ near Piteå. 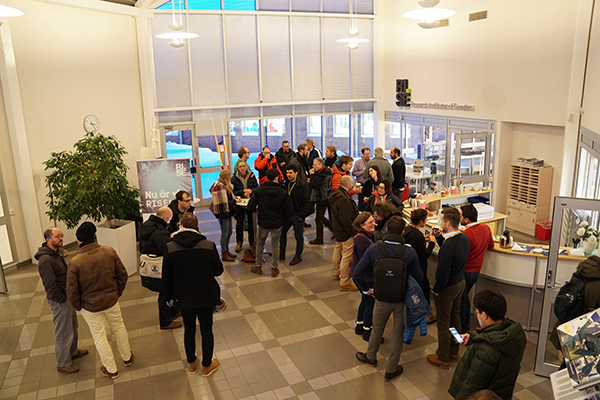 The attendees were then divided into five smaller groups before continuing the tour with notable examples of research and innovation on innovative materials, and their successful commercial use. 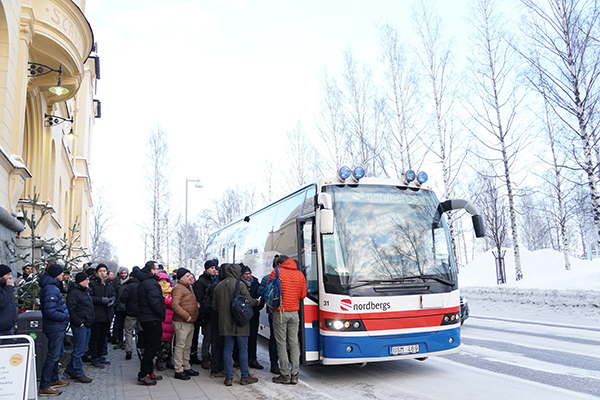 During a walk through the RISE institute formerly known as SWEREA SICOMP, participants were able to have a look at the well-equipped laboratories which are used in research on composite material properties and on their processing as well. 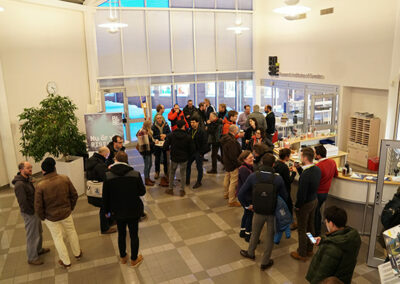 Overview presentations from researchers Erwan Juin and Kenneth Strand showcased examples of SICOMP’s/RISE’s R&D projects in the maritime and hybrid materials for the automotive industry. Next stop was RISE’s neighbor, PODCOMP. 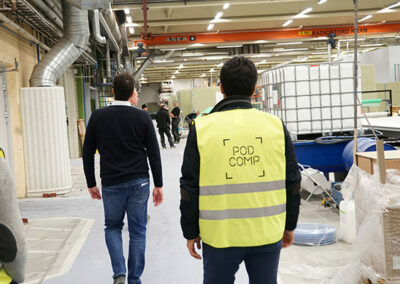 Peter Lundmark (CEO), walked everyone through the company’s partly automated production facilities for complete bathrooms which are used in prefabricated houses. This was followed by a lecture in the nearby lecture hall, where Tord Gustafsson (R&D PodComp) and Tommy Öman (Researcher RISE SICOMP) gave a highly instructive lesson about bio-fibers and the chemistry behind. It should be noted that lightweight structures are not only composites. 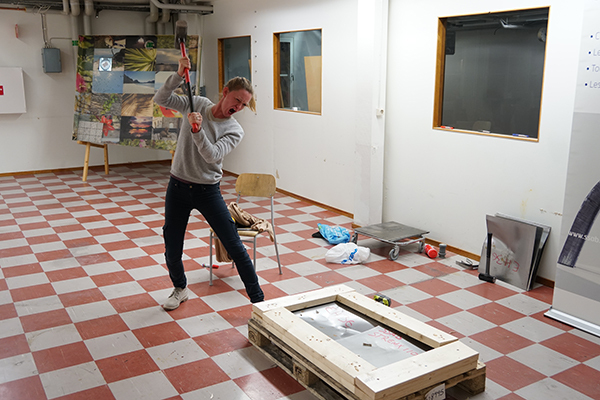 Joakim Nyström, SSAB concluded the day by inviting everyone to a strongman game, trying to smash or bend specimens of mild and high tensile steel. Participants therefore got very concrete examples of the material and also a chance to feel the difference of its properties, which can be translated into weight saving in ships. The seminar day began with a short introduction by Franz Evegren, RISE. 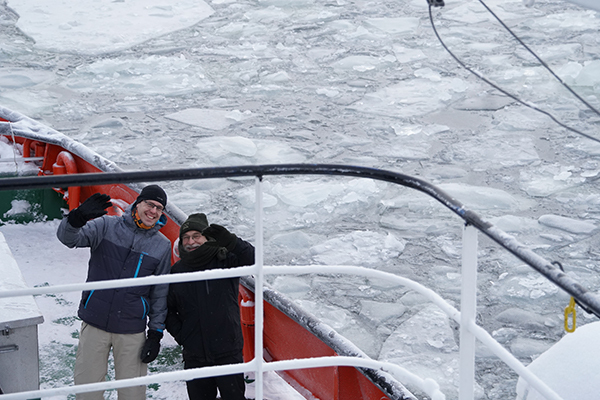 He was followed by the first speakers of the day, Arjan Bouvy and Tariq Dawoud from Hydro, who started off the seminar day in a sunny but cold (-27°C) Piteå with a presentation on aluminum solutions for ship construction. They presented an interesting case study of aluminum hatch covers which they claimed increases stability and allows for higher payload. Next up was presentations from the RAMSSES Technology Transfer initiative, focusing on rules and regulations for lightweight structures in other sectors. The first speaker was Rafael Luterbacher-Mus from GMA Werkstoffprüfung. He gave an introduction on the extensive and time-consuming process of testing new and innovative materials in the aerospace industry. Laurent Morel from InfraCore presented the regulatory framework for FRP composite structures from an infrastructure perspective. Rules and EU regulations for FRP are under development in this sector and the goal is to create an FRP Eurocode by 2022. 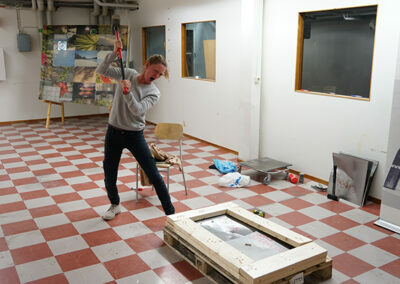 One issue that must be tackled is the wide range of materials, which makes it difficult to create guidelines. Finally, Simon Quinn from SMMI highlighted the need for modernizing composite regulations, emphasizing on adopting knowledge and best practice from other sectors. Absence of harmonized support for performance or goal-based regulation inhibits growth and delivery according to prof. Quinn, who subsequently presented a case study to show how load carrying structure made of advanced composite materials can be qualified within the existing regulatory systems. At lunchtime, a social event took place where participants were given the unique chance to go on an Ice Breaker tour onboard the ‘Arctic Explorer’. 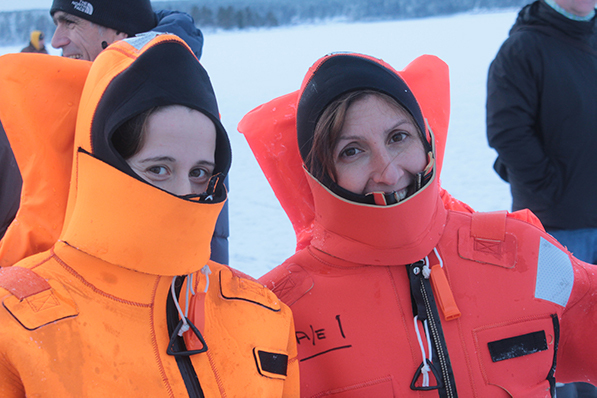 Participants were taken on a journey through the frozen Bothnian Sea before the vessel stopped. In front of them – the frozen landscape, behind them – the exposed fairway. 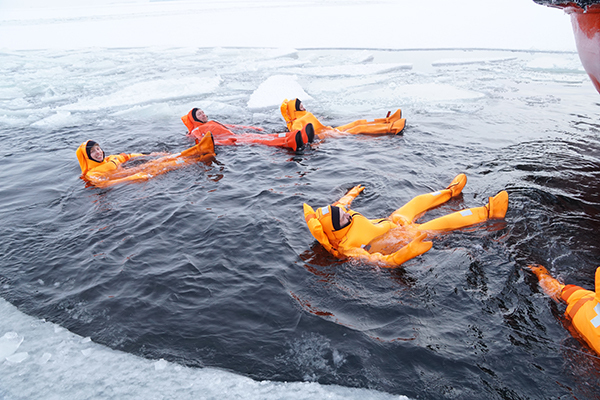 Several participants decided to change into rescue suits and opted for the chance to swim in the cold water before returning to the conference building. 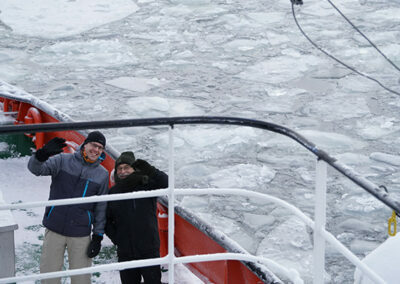 The tour, which literally broke the ice between the attendees, was truly an unforgettable experience. Back at the conference venue, Jan Pudas from Mobilaris Industrial Solutions presented a real-time decision support system for improved workforce safety by tracking vehicles and personnel. Within the maritime sector, such a system could potentially be employed to decrease the time required to complete evacuation. The next presentation highlighted a somewhat unusual lightweight material, namely high strength steel as Joakim Nyström from SSAB showed there are more alternatives than aluminum and FRP composites. He stressed the fact that high strength steel should not be overlooked when considering lightweight solutions and showed promising examples of application areas. Igor Alexander from Monocrom showed how they extract components of materials by using high energy pulsed lasers. 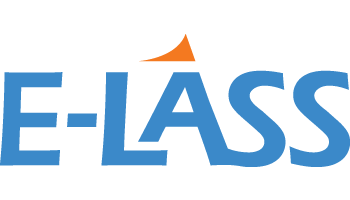 The laser which is focused on a sample, generates a plasma which is then analyzed. It can be used for selective recovery of aluminum and selective recovery of composites from end-of-life ships. Francois Geuskens from Curve Works continued the seminar day with a presentation on how they produce small series 3D curved structures in an efficient way. The solution is called adaptive mould and comes with a matrix of individually adjustable pins that support the material to be formed. The device is heatable and can be used e.g. for prepregging and vacuum infusion. 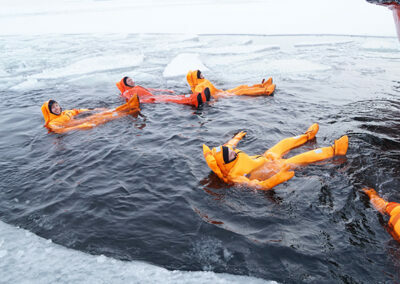 Various applications in boat building and in the construction industry have already been realized. Gareth Davis, NetComposites gave a brief project update on their involvement in the research project RAMSSES before Beate Brede from Fraunhofer, concluded the seminar day with her presentation on how to enable the industry to tap the full potential of lightweight design. The essence was teaching employees how to do it right, from idea to production and how to choose the right material for its right place. During the event, several different material solutions were showcased, and the conclusion made is that it is not about what material is the best in general but rather which material is the better fit depending on the situation. Materials should be used where it has the highest potential, and this means there are always different lightweight solutions to use for different constructions depending on the purpose. 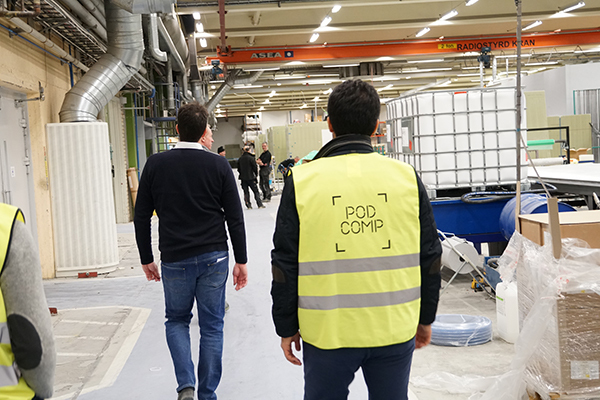 Thanks to everyone participating in Piteå and a big thanks to our hosts PodComp and RISE SICOMP and of course our sponsor Mobilaris! Our next E-LASS/RAMSSES meeting will be our 10th (!) and is scheduled for June 2019 where we will visit AIMEN in Vigo, Spain. Make sure to Save the date!